Push the boundaries of games making by studying a Game Design and Production degree in the city that spawned Grand Theft Auto. 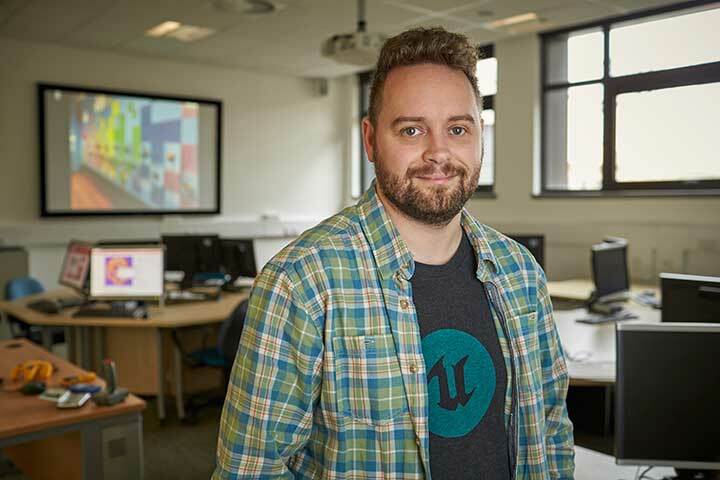 Why study Abertay's BA (Hons) in Game Design and Production? Learn to harness your creativity and get set to push the boundaries of games making by studying in the thriving city that spawned Grand Theft Auto (GTA). Gain a degree from one of the most prestigious game design schools in the world. Developed for creative and technically minded people with a desire to become a key part of the games industry, this degree is designed to make you work-ready, teaching you game concept and asset creation, game prototyping, and production and leadership skills. You’ll be encouraged to work creatively and professionally as a game designer, communicating concepts through prototypes, game assets, documentation and presentations, in addition to honing your communication and management skills through multidisciplinary projects. At Abertay, we enjoy an international reputation for excellence in computer games education. This stems from our unique student experience, which places you in a simulated workplace that promotes innovative game creation. An introduction to the games industry that develops skills in design and production practices, pitching and communicating game concepts, and the planning of game projects. Provides students with a working knowledge of computer arts production techniques and practices required to design and communicate concepts for games visually. An introduction to the core concepts of computer programming through practical examples within games engines. This module provides an introduction to computational thinking for students who want to work in the games industry. It is for students who require knowledge of programming for their game design practice, but who are not primarily programmers and who have limited or no experience in programming. An introduction to game studies as a meta-discipline. This module provides students with an understanding of the concepts, issues, and texts for the study of games and related cultural forms, so that they can form and disseminate cogent analyses and critiques. An introduction to the knowledge, processes and techniques necessary to formulate and explore effective, innovative game ideas with consideration for the structure of both gameplay and narrative design. Module content includes: game genre mechanics; constructs of gameplay; design documents and artefacts, game design process; narrative theory for game design; experimental approaches; visualisation and digital techniques; audience and cultural engagement. An introduction to the 3D game art pipeline that provides students with the knowledge and skills required to design and build their own 3D assets for games. Module content includes: software skills; polygon modelling; curves and NURBS modelling; UV mapping; texture production; 3D painting; sculpting; lighting; modular production. Provides students with the theoretical, practical and technical knowledge required to utilise game engines and operate as an effective level designer. Module content includes: terminology and concepts; editing systems; scripting game logic; AI and pathing; physics; interface; content; cameras; spatial and lighting design; user experience. An overview of the contexts of design across a range of creative fields. This module challenges students to investigate design history, the role of the designer, along with emergent design practices. Module content includes: design history and principles; the design process; design beyond games; diversity; accessibility; design practice; design futures; ethics. A complete introduction to the processes and purposes of designing and developing a piece of interactive entertainment. Module content includes: historical overview; concept and communication; design process; core design; the development team; rules and mechanics; look and feel; cultural and commercial awareness. Students work together as individual subject specialists on an interactive media project as part of a multi-disciplinary team. Students will communicate with clients and relevant stakeholders, take part in pitching concepts and deliver presentations, contribute to the iterative design and development of the concept, research and test technical pipelines and create project documentation and planning materials. Provides students with an in-depth understanding of the issues around the production process and managing a creative team. Module content includes: leadership; controlling software and asset production; production control; human factors; handling criticism; team dynamics; case studies; professional practice and ethics; managing risk and uncertainty. Students will engage with the creative and technical processes involved in the design and construction of virtual environments. Provides specialist skills in the critique, design and construction of virtual environments. This is particularly helpful to those who have an interest in level design or environment art for games. Working within a multidisciplinary team, students will develop an interactive media prototype based on the planning and initial prototyping of concepts conducted within the module DES301 Professional Project: Planning and Prototyping. The emphasis is on the development and delivery of a final digital prototype in response to an initial creative brief, taking into account both stakeholder and user feedback. Provides students with the technical and creative skills necessary to create prototypes that demonstrate the functionality of game mechanic design and promote rapid prototyping as a useful evaluation tool and an essential part of the development process. The skills and knowledge to develop your understanding of your field through theoretical and critical underpinning of academic writing. Module content includes: surveys of literature – identify and critically analyse existing literature; critical frameworks; disaggregation as an analysis technique – identify and deconstruct existing artwork interpreting the decisions made by the artist; identify the research question and research methods; dissemination of the research findings. This module allows students to formulate a contextual, theoretical, and practical foundation in a self-selected area of professional practice and research. Students will evaluate existing research, texts and projects with a view to developing a project proposal and will develop a portfolio of practical work pertinent to their own professional practice and the selected honours project topic. Learn to engage critically with the creative industries. Discuss the global marketplace for creative media, the development of business ideas, and the demonstrable knowledge, expertise, and planning expected by employers and investors. Consider which creative industries align with your own personal ambitions for employability or entrepreneurship such as Games, Animation and Visual Effects, Film and Television, Graphic Design, Web and Digital Media, and Installation Art. Module content includes: the creative industries; understanding the marketplace; creative industries development lifecycles; people, roles and professional expectations; legal and financial understanding; ethics; entrepreneurship; personal branding and preparing for employment; career routes and development; self-employment in the creative industries. You undertake an extensive creative research project fusing theory and practice to create a large-scale portfolio of work, sensitive to critical theories, concepts and practices within a specialist area of enquiry. This module will have its own discrete assessment criteria and deliverables as set out in a learning contract and agreed by project tutors, but will be an expression of the theme(s) addressed by your research aim. You’ll have regular progress meetings with your project supervisor. The output material for your project should reflect the full process from inception to completion. It will culminate in a professional well-developed presentation by you that demonstrates a full and considered answer to the research question. Approaches research as an active process of inquiry that leads to the production of a dissertation which appropriately communicates research process and findings. A large part of the course revolves around making games and building a portfolio that demonstrates your skills and specific area of creative practice. You’ll spend around 15 hours per week in lectures, tutorials and practical activities, with the remainder of your time spent in self-directed learning. Lectures, tutorials and practical activities increase your understanding of game design and production, and allow you to develop competencies in technological, theoretical and collaborative work. During first and second year, your work will mostly be assessed through practical coursework, presentations and reflective essays. In later years, taught module assessment is by a mixture of critical essays and coursework. Project modules are assessed through the submission of conceptual work, design solutions, interactive media products and project reports. The final year dissertation and project allows you to focus on a specific topic within design and production, and develop a specialist area of expertise. If you’re keen to undertake the accelerated degree, you’ll complete the first two years of the degree programme alongside those students following the non-accelerated route. Acceleration starts in May at the end of second year. The table below illustrates the difference between the two routes. Every year, we run the prestigious Dare Academy project, where teams of students are given a unique month-long summer hot-housing experience with games industry mentors to build and polish an industry-standard game. We then showcase the games at EGX, the UK's biggest games event, and the top three teams are flown out to visit international games partners and to be profiled. This is a unique offer for Abertay games students and it ensures you stand out from the crowd. If you’re applying from overseas or from outside Scotland, we have scholarships available to make your studies more affordable. Please see our Undergraduate Fees and Funding page for further details. . The Ninja Kiwi Scholarship is a one-year scholarship of £1,500 and is open to students who are entering Year 4 of Games courses. We work closely with leading game developers such as 4J Studios, Sony Interactive Entertainment, Microsoft and Ubisoft, making graduates from this course highly employable within the games industry. These roles are spread across a variety of projects, including AAA games, independent, mobile and online marketplaces. The production and leadership theme of the programme has also thrust entrepreneurial graduates towards forming their own companies in the games or media sectors. Small games studios to national and international media groups require talented individuals with expertise in team management, design and production control of new media products. The games industry offers long term career potential through its continued expansion. Prospects have never been better, as it’s a growing and exciting industry, with a global demand for skilled development staff. There are excellent industrial links across all the games programmes at Abertay. You’ll receive guest lectures and demonstrations from external companies as part of normal teaching. Abertay Game Lab also runs a series of special events and masterclasses with well-known local and international designers and developers. These are on offer to all students. Meet some of our Game Design and Production graduates and find out what they've gone on to do. Arran changed his career goals from history teacher to computer games designer. He now works at Mediatonic. Eilidh works as a Games Designer making new levels for Angry Birds Pop. Taking part in a TEDx event on campus helped Natalie's career fall into place. An Open Day is your chance to get an up close and personal experience of the University and the city. You'll come away with all the information you need about us and the courses you're interested in.